Today Greater Noida police had arrested criminals regarding a face burnt dead body that was found near divider over the road heading towards Tilpata Chowk to Kasna. On March 3rd police had recovered a dead body with burnt face near divider over the road heading towards Tilpata Chowk to Kasna. Later the victim was identified as Aabid a resident of Dadri. Taking action in the incident earlier police had arrested two accused while the third accused was arrested today near from Peer mazar under Surajpur police station . 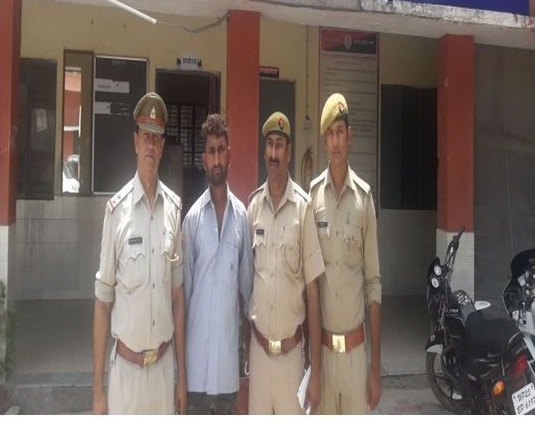 The accused are identified as Budha Jadav a resident of Dadri and Police had recovered a Knife that was thrown into bushes near Ansal Society around 400 meter away from crime spot when they had arrested two accused earlier. The accused had a criminal history earlier also and now they are being sent to jail after being presented before court.